Cars competing in the Coca-Cola 600 Monster Energy NASCAR Cup Series race at Charlotte Motor Speedway and in the Indianapolis 500 Verizon IndyCar Series race at Indianapolis Motor Speedway, both on May 28, will carry special decals in honor of former NASCAR driver John Andretti. 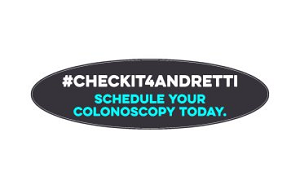 Andretti was recently diagnosed with stage four colon cancer and has begun a campaign urging peopole to get regular colonoscopies. A part of the effort has been the creation of the #CheckIt4Andretti Twitter hashtag. The decals on the race cars and Charlotte and Indianapolis will feature the hashtag. Also, the No. 34 Front Row Motorsports Ford of Landon Cassill in the NASCAR Cup Series will feature the #CheckIt4Andretti hashtag as part of its overall paint scheme. Andretti was the original driver of the No. 34 FRM entry. Andretti already has had surgery to remove a tumor and will undergo chemotherapy. He will undergo surgery, again, about halfway through his chemotherapy. The surgery Andretti already has had removed 12-14 inches of his colon. Afterward, scans showed that the cancer had already spread to his liver, and possibly, his spleen. Andretti competed in 393 NASCAR Cup Series races between 1993 and 2010, winning twice. He is a member of the Andretti family of IndyCar fame — a nephew of Mario Andretti and cousin of Michael Andretti. He made 10 starts in the IndyCar Series between 2007 and 2011.